L. Frank Baums The Wonderful Wizard of Oz is a classic, and it takes some gumption to retell the story from another perspective. Using a different media is common. The movie, of course, was a great success. Slightly less so was The Whiz, but Wicked has gotten decent acclaim. To write a book, though, well, that takes big ones. Scott Stanfords take on Oz is decidedly darker and macabre. There are no happy munchkins, no happy inhabitants of the Emerald City. The yellow-brick road is a broken down, crumbling path running over primordial black ooze which threatens to overtake it. Dorothy herself, just turned 18, is a veteran of the foster care system, someone abused by a long line of perverted and cruel fake fathers. She is transported to Oz, but not the same Oz as in the original book. Captured by the Witch of the East and her evil munchkin hybrids, Dorothy faces horrific scarring as the witch does not want there to be anyone prettier than her in Oz, but accidently-on-purpose, Dorothy manages to kill the witch and take her silver boots. What works about this book is that enough of the storyline remains true to the original to keep in context, but each event, character, and incident has enough differences to grab the readers attention. And those differences are deliciously dark. The author writes in a somewhat stilted and unique third person present narrative mode. While this may be to further distance the narrative from Baums original, I felt if also distanced me, as a reader, from Dorothys journey. He also chose to use italics to set off quotes, sometimes jumbling quotes from more than one speaker in a single paragraph. This broke into the flow of reading as that caused a break while quotes were sorted and attributed to the proper character. This book is a decidedly edgy and morbid take on the classic original. If could have failed horribly. But it didnt. I works quite well, and I recommend it to those who enjoy the darker side of life. The authors bio states that this is his fourth novel. I have not been able to find any of the others listed for sale, but I would be interested in reading more of his work. His decidedly different view on things makes him stand out from the pack. 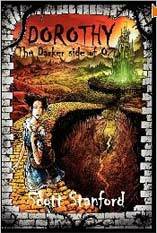 For more reviews or to buy Dorothy: A Darker Side of Oz from Amazon.com, click here.